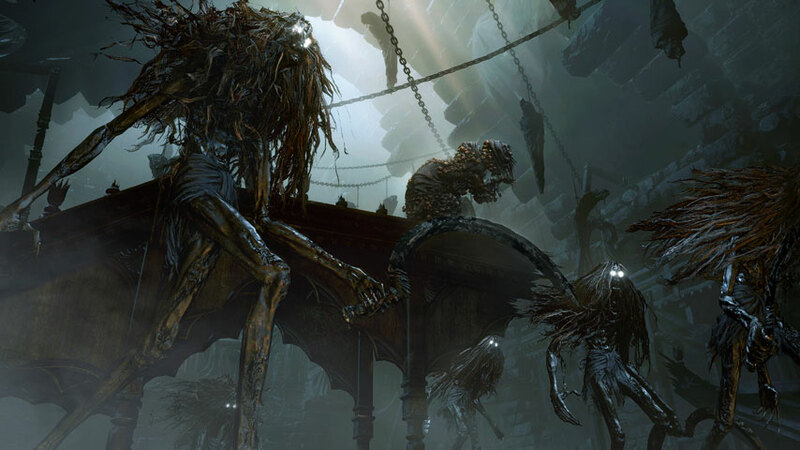 Bloodborne’s fifth boss battle pits us against the Witch of Hemwick – and friends. Bloodborne offers a pretty stingy reward for beating down the fearsome Witch of Hemwick: four measly Bloodshot Eyeballs. Not a great return for what can be a nightmare fight – but don’t worry: the real reward awaits you in the following room. You don’t have to do this fight to finish Bloodborne, but it’s the only way to enable the use of Runes, which are quite important. Well worth the investment. This battle can be very easy, if you absorb Bloodborne’s primary lesson: speed is everything. The more quickly you take down this boss, the easier it will be. You may want to level up stats related to damage output and upgrade your weapons if you’re struggling. The reason you have to be quick is that Soot Monsters will spawn in increasing numbers as the battle drags on, and they’re a real pain given your limited number of Quicksilver Bullets. It’s best to ignore them if you can, and just be quick so you don’t end up with too many of them. The reason it’s tough to be quick is, well – the Witch is tricky. This is the pattern of the battle: you find the Witch, you attack the Witch, the Witch buggers off. She can be bloody hard to find her again, both because it’s so dark and because you need to be quite close to spot her. When the battle begins, your attention is drawn to a Soot Monster, but look to your left – that flimsy looking thing is the real boss. Go hit her as hard as you can, as quickly as you can. There’s little to worry about beyond an area of effect attack you don’t want to be a part of, clearly signalled by a purple glow around her feet. Don’t worry about the similar purple glow that appears when she vanishes; it’s not dangerous. Keep hunting down and beating the Witch until she gets to about half health. At this point, a second Witch will appear. This one is considerably more deadly, as she uses magic and a grab attack similar to a Leech Warlock’s. You need to be even quicker now, as if you take too long you’ll end up with a third Witch, and then you have to kill all three within one minute of each other or they’ll all respawn with minimal health. When you bring down both or even all three Witches, light the Witch’s Abode lamp. Before you head back to Hunter’s Dream, go on into the next hallway and down the stairs, open the door, and enter to find the Rune Workshop Tool. This is the real prize of the battle, allowing you to upgrade your weapons with Runes at the Memory Altar in Hunter’s Dream. Now: to the Forbidden Woods and Shadow of Yharnam.